You may be wondering where we've been. Over the course of the last year, our team has been working through the comments gathered at the last Community Consultation Meeting, Local Advisory Committee Meetings, and the circulation of the Plan to the City in preparation for the re-submission of the Precinct Plan, which was completed on April 10, 2018. You can view our Allen East District resubmission here. During this time, we revised our plan and have a new name. Build Toronto and the Toronto Port Lands Company have joined together to create a unified agency known as CreateTO. We are defined and driven by our collective experiences and areas of expertise to find creative solutions for the City's real estate. As a new City agency, CreateTO will focus on all City's real estate assets to create new opportunities and partnerships within communities across our City. To learn more about us, visit the About CreateTO page. Coming up next will be the final community consultation meeting held by CreateTO and City Planning to wrap up the Allen East District East process. Future phases of development in the Allen East District will include more community meetings where you can share your feedback and speak with City planners, architects and members from our team. It is important to note our role in exploring redevelopment opportunities for the City's real estate assets and our commitment to our projects, including the Allen East District, has not changed within the mandate of the new agency. Stay tuned for updates on the Allen East District Project by signing up for email updates by clicking here. For summaries of all consultation meetings to date, please visit the Consultation Materials' pages by clicking on the links at the top of the page. The updated District Plan Report and all supporting documents listed above can be viewed and downloaded by clicking here. In the coming months, City staff and Build Toronto (now CreateTO) will be hosting a Community Consultation Meeting to present the updated District Plan and discuss next steps in the process. The meeting details will be posted here as soon as a date and time have been scheduled. Once the above referenced meeting has occurred, City staff will be in a position to prepare a Final Report with recommendations. This report will be before North York Community Council and will afford members of the public an additional opportunity to provide comments to the District Plan. It has yet to be determined when the Final Report will be before Community Council. Since the Community Consultation Meeting held last year, we received all comments from City staff on the Allen District Plan submission for the lands east of Allen Road. Comments received included very detailed commentary on specific background reports, as well as overall remarks with respect to the District. In an effort to summarize the wide-ranging comments, we have grouped the comments into various "focus areas" in a summary, which you can review by clicking on the link below. City staff have reviewed and concur with this summary We will continue to meet with City staff to discuss the comments received before the District Plan resubmission. Since the Community Consultation Meeting held last year by Councillor Pasternak and City staff, we have received a first round of comments from City Staff. We will be meeting with City staff at the end of March to discuss and address the comments. A summary will be posted to the City's website and on this website following this meeting. We will be updating the Allen District Plan in order to resubmit it to the City. Prior to this resubmission, we will be hosting the second round of community consultation to present updates to the Allen District Plan and discuss refinements for Phase 2 of the community engagement process. This will include a LAC and community meeting, similar to the first set of meetings (see process graphic below for more detail). We will post the community details here as soon as we've scheduled a date for the meeting. Thank you for your interest and continued participation in the process. We have launched this website as a community resource for all information related to the Allen District Plan as well as our future development plans in the area around Sheppard Avenue West and Allen Road. Updating this website is the CreateTO team as well as Swerhun Facilitation, independent community facilitators that were hired to help shape the community engagement for this project. 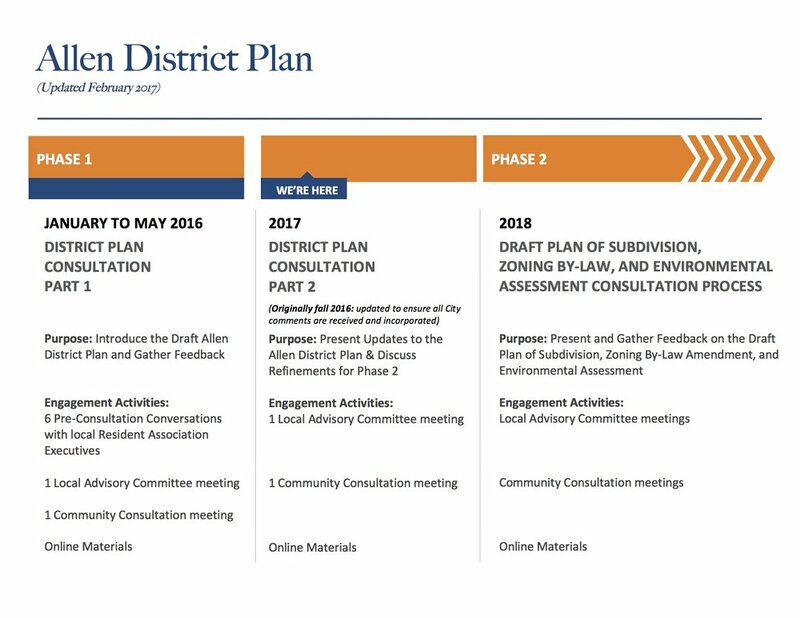 Background - is an introduction to the Allen District Plan and how it ties into the Downsview Area Secondary Plan and the area's future development. Here you will find all reports associated with the project such as the full application for the Allen District Plan as well as links to Staff Reports. Consultation materials - is where you will find updated summaries and any other material relating to the past community meetings as well as information on upcoming meetings. About CreateTO - is an introduction to the team leading the efforts of the Allen District Plan as well as future development plans on the western portion of the lands. We encourage you to sign up for updates through the electronic form found on this page. This will allow you to receive updates directly to your email. If you have any questions or comments please feel free to contact us through the contact page. You can find out about additional planning studies in the City of Toronto by visiting the City of Toronto’s Planning Studies Webpage. Located around the Downsview Subway Station, the Allen District is one of the districts comprising of 73 total acres and since 2009 Build Toronto (we are now operating as CreateTO) has been tasked with developing 57 acres of land in the district east of Allen Road. To find out more click here.